Urbana’s Samantha Rooney (22) looks for teammate Maleah Murphy (3) to set a screen on Monday against North Union. 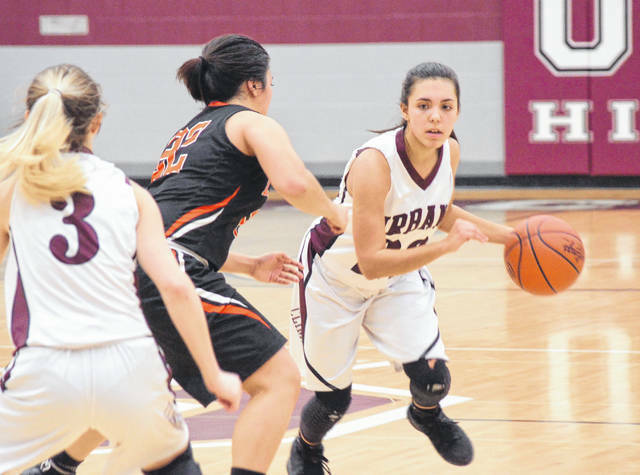 Urbana dug itself into an early hole and couldn’t recover against visiting North Union on Monday, falling to the Wildcats, 39-36, in CBC/MRD girls basketball. UHS trailed 17-13 at the half, despite a last-second layup from Alaina Lyons. The game was tied after the third quarter thanks in part to a big three-pointer by Samantha Rooney with 45 seconds left which gave Urbana the lead for a very short time. It seemed just as UHS would claw its way back into the contest, North Union hit a big basket to push the lead back to multiple possessions. Lyons had 13 points to lead the Urbana attack. Marissa Horn added 6 points with Rooney and Shelby Stoops chipping in 5 each. Urbana defeated Indian Lake, 51-39, in CBC girls basketball on Saturday. The ’Climbers led, 21-20, at halftime, but pulled away in the fourth quarter. Stoops had 10 points and 15 rebounds, Kacie Martin had 10 points and 8 rebounds and Clair Shelpman had 9 points and 7 rebounds for Urbana. The Hillclimbers (4-16, 2-6) play at North Union on Wednesday. https://www.urbanacitizen.com/wp-content/uploads/sites/36/2019/02/web1_SamanthaRooney020419_ne20192418561666.jpgUrbana’s Samantha Rooney (22) looks for teammate Maleah Murphy (3) to set a screen on Monday against North Union.